This chapter explores, tentatively, the connections between, on the one hand, a form of political imagination that in Western nation-states looks for inspiration to the ‘1968’ moment and, on the other, an understanding of the political as ‘critical ontology of ourselves’. The main problematique is the contemporary conceptualization of ‘difference’, analysed as an imperative of all our political involvements. And the analytical concern is with the persisting desire of academics to posit ‘1968’ as the organizing principle of a symbolic, theoretical and political order or reality. 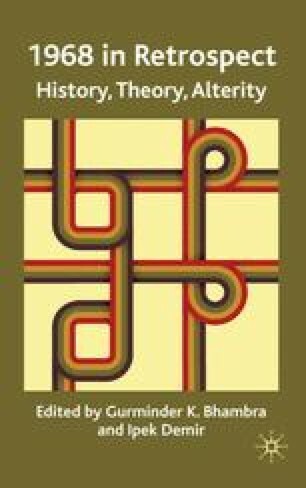 I argue that by using ‘1968’ as the ordering principle of history and of the present we create a narrative in which global history is subsumed to and made sense of only in relation to the history of Europe. And we anchor our political practices to technologies of power that function by positing the difference between ‘Us’ and ‘Them’ as one of substance, thus acting in synergy with the dominations and exclusions we should rather struggle against. More precisely, that all contemporary political forms that borrow their political ontology from the 1968 moment — various forms of feminism, post-structuralism, multiculturalism, grass-roots movements, identity politics and the list can go on — cannot but support the similar technologies of subjectivization that (neo-)liberal apparatuses use to dominate and exclude.